I've previously blogged about organic makeup being relatively difficult, although far from impossible, to find. 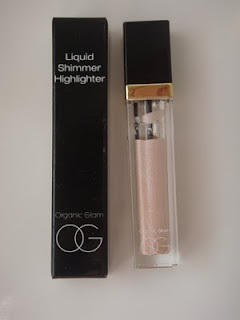 I thought an apt follow-on from my Organic Pharmacy body scrub review earlier this week would be a review of Liquid Shimmer Highlighter from the makeup arm of the brand, Organic Glam. 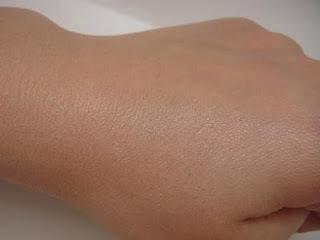 I love using highlighters to pep up skintone so I was intrigued to try this, particularly as makeup tends to sit on the skin for long periods of time and therefore, I feel that it's worth considering organic options. The packaging is quite sleek although I wasn't overly wowed by it. The square tube has a small brush applicator integrated into the lid which is a nice touch, although it's quite fiddly to work with when highlighting larger areas such as cheekbones and doesn't lend itself to blending. Still, it's handy for precision application such as along the nose. I like that the tube is transparent so that you can see how much product is remaining. The soft texture is pleasant and creamy and dries to feel like a powder, adding to its staying power. I like that it's available in three shades; Warm Gold, Silver Ice or, as I trialled, Pink Ice. 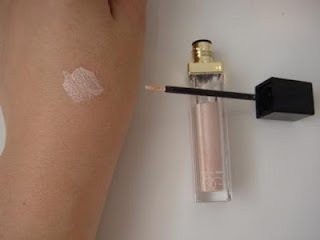 I was impressed with the colour itself although I found that the high degree of shimmer particles meant that it wasn't particularly wearable on an everyday basis. At £19.95 for just 5ml, it is expensive and you can find very similar non-organic products which offer far better value for money and personally, this is the most off-putting aspect of Liquid Shimmer Highlighter. For this reason, I'd only recommend investing if organic is particularly important to you.